Blame it on Danny Ocean. The onscreen film persona of George Clooney is hard to separate from not simply the suave and debonair characters he plays in Ocean’s Eleven and other films but also George Clooney in real life adorning the covers of countless magazines on a given grocery store rack. Of course, it doesn’t help when even in a film like Michael Clayton where he plays a “fixer” of problems (an associate calls him a miracle worker) for a top New York law firm with a weakness for high stakes poker, when the makeup artist applies copious amounts of eyeliner and mascara to make him all the more Vanity Fair ready and a book lying casually out in the open for the camera to pan across is entitled Alpha Male. This being said, Clooney is, as always, an engaging and commanding screen presence, turning in a fine portrayal but it’s the supporting players, most notably the fierce and taut performances by Tilda Swinton and Tom Wilkinson that steal the film. 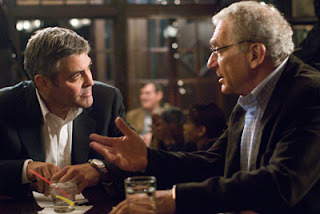 Michael Clayton, which was nominated for the 2007 Golden Lion at the Venice Film Festival, marks the directorial debut of writer Tony Gilroy who penned the wildly popular Bourne scripts for the blockbuster Matt Damon trilogy. After Arthur Edens (Wilkinson), his colleague stops taking his bipolar medication and flips out unprofessionally, Clooney’s Clayton is sent for damage control, later realizing that Edens may have been onto something much larger in scope in his sabotage of a class-action multimillion dollar lawsuit settlement facing agricultural corporation U/North, whose legal head Swinton is trying to control as well by any means necessary. Employing a crisp muted color scheme in its cinematography by Robert Elswit (Magnolia, Good Night, and Good Luck)—the film is sophisticated fare for adults that recalls high quality Grisham thrillers popular in the 90’s and indeed Firm director Sydney Pollack co-produces and stars in Clayton, but the film has been praised way out of proportion by critics all clamoring under the star power of the vehicle in trying to predict Oscar season. One thing remains certain, however and that is if Oscar comes calling, there is no one worthier in Clayton than the impressive but often overlooked Wilkinson who shows us the same passion and precision evidenced in his previous Oscar nominated turn for In the Bedroom.